Water providers have been collecting and utilizing data to perform important but traditional tasks: Supervisory control and data acquisition (SCADA) devices speed information across networks, and smart metering infrastructure systems measure consumption and contribute to customer billing. But, as utilities wrestle with addressing aging foundational assets while balancing limited capital and rising calls for lower costs and safer water, there is new urgency to explore how data can drive and optimize asset performance and reduce risk. A new generation of innovative analytics tools coupled with the development of smart integrated infrastructure offers plant operators and water management a new opportunity to meet those needs and more easily transform raw data into actionable intelligence. When capital is low, tense questions arise about where and how to apply data analytics solutions in order to achieve the biggest return on investment. Despite organizational mandates for smarter operations, many water utilities still appear unclear about analytics-based decision-making. Nearly 40 percent of respondents to Black & Veatch’s 2017 Strategic Directions: Water Industry Report survey said data figured into their processes but not operationally; another 20 percent said data analytics weren’t part of their current processes but is figured into their strategic planning. Outside the fence (distribution and collection), data has a range of applications that can more quickly identify leaks, reduce water wasted, reduce sewer overflows and measure asset health. Inside, data can unlock dramatic operational efficiencies and inform new planning and investment strategies because information is not only collected but also conveniently visualized to help operators make smarter decisions. Data can play starring roles in improving the water treatment process, reducing energy costs and predicting asset failure. 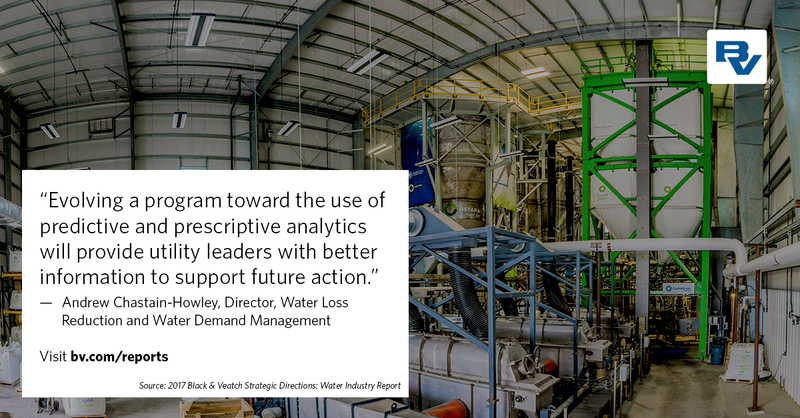 Three examples of how a southwestern U.S. treatment plant used data analytics in key operational areas, download the full 2017 Strategic Directions: Water Industry Report.